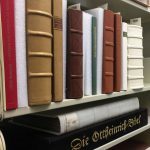 The Division of Special Collections acquired eight German manuscript facsimiles in 2014 with gift funds donated by Susan Tolbert in memory of her late husband, Dr. Lakey Tolbert. The reproductions are based on German manuscripts from the fourteenth century and were acquired for students of History and Modern Languages to use in their course work. These items are housed with the Williams Collection, Gorgas Library 301. For more information, contact Dr. Nancy Dupree (ndupree@ua.edu), Curator. In 1414-1418 an ecumenical council of the Roman Catholic Church was held in Konstanz, a city in southwest Germany near the Swiss border. Several issues needed to be settled, particularly the schism in the church which had led to several competing popes, and the early beginnings of the Protestant Reformation. Hundreds of important political and religious figures gathered in Konstanz, along with servants, soldiers, entertainers, prostitutes from all over the region. Ulrich Richental (1364-1438) was a layman, a landowner and businessman, who was involved in local arrangements and financial matters associated with the Council. He observed and recorded the progress of the Council, including all the public events and ceremonies, in the Chronicle of the Council of Konstanz. Since he was not part of the closed sessions, Ulrich emphasized the life and activity in the city. Ulrich probably did not draw the illustrations of costumes, heraldry (coats of arms), weapons, and other aspects of medieval life, but they are considered accurate. Ulrich created several manuscripts based on his notes on the council, and the five surviving manuscripts are copies of his work. Ulrich wrote in Latin, but this manuscript is in German. The original is held by the Rosgartenmuseum in Konstanz, Germany. (1) The World Chronicle was written by Rudolf von Ems, an Austrian nobleman born around 1200. His poem consists of 33,000 verses in consecutive rhyme. It recounts the history of the work from world from the Creation to the death of King Solomon, based on the Old Testament. (2) Charlemagne recounts the life and adventures of Charlemagne, hero and king of France. Based on the Old French epic Chanson de Roland, the poem depicts Charlemagne as “the perfection of a Christian ruler.” The illustrations, though illustrating ancient stories, actually depict the court life of the 13th century. The author of Charlemagne is usually referred to as Der Stricker, and very little is known about him. He wrote several other poems. The manuscript contains beautiful illuminated letters and 58 small pictures. The pictures are painted in color with the background gilded, giving a three-dimensional impression. The original is held by the Kantonsbibliothek in St. Gallen, Switzerland. This is a facsimile of a manuscript of the Song of the Nibelungs, the national epic of Germany. The story, the account of the adventures of the dragonslayer Siegfried, goes back into antiquity. About 1200 an unknown poet combined two of the stories (usually called sagas) into one story of Siegfried. Of several manuscripts of the poem, this one is the oldest and the most complete. 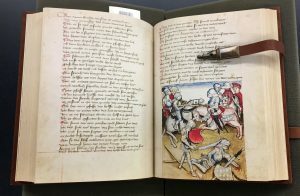 The manuscript includes 37 illustrations depicting courtly and chivalric scenes. These are pen-and-ink drawings with a color wash. This manuscript is less lavish than some others; the pictures are not ornamented with gold. It is known as the Hundeshagen Codex, after a Berlin librarian who is said to have found it in an antiquarian bookstore in 1816. The original is held by the Staatsbibliothek in Berlin. The Saxon World Chronicle was written in the mid-thirteenth century in the region of Saxony, in what is now Germany. It is the first historical work written in German prose. It relates the story of the history of the world beginning with the Creation as told in the Biblical Old Testament, and brings it up to the story of King Frederick II, King of the Germans, who died in 1250. This Chronicle uses many illustrations; most of them are small pictures placed next to the lines that the drawing illustrates. The author of the Saxon World Chronicle is unknown. Pictures and writing are believed to be by different hands. It is the oldest and most elaborate copy of the Chronicle. At the end of World War II it was seized by Russian soldiers and taken to St, Petersburg, but it was ultimately returned. The original is held by the Universitäts- und Forschungsbibliothek Erfurt/Gotha at the Universität Erfurt. 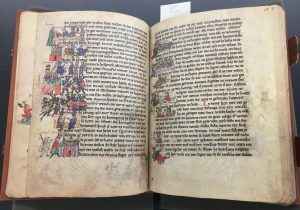 This facsimile recreates the only surviving manuscript of the Illustrated Chronicle, a history of the Swiss Confederation from 1150 to 1470. The author, Benedicht Tschachtlan, was a high-level employee of the government of the Swiss city of Bern for 45 years. He was editor/compiler of the work; he used chronicles written by others and wrote only a small part himself. This manuscript is especially admired for its illustrations. It contains 230 mostly full-page paintings; 200 depict military scenes and provide many details of the life of the time. As with the other facsimiles, the cover is an exact replica of the original. The binding was sewn on five cords by hand in the medieval manner. Exceptionally fine manuscripts were bound on five cords; most had three. The original is held by the Zentralbibliothek Zurich, Switzerland. This is a facsimile of a history of the Zwettl Monastery in Austria and of the Kuenring dynasty which founded it. The monastery was founded in 1137, and the manuscript was created in 1310-11. The title literally translates as Book of the Founders. It began with a project to copy the monastery’s documents to prevent them from being lost. The work includes business documents such as rent rolls and land records, as well as historical and genealogical accounts. The manuscript is mainly written in Latin, with several parts in Middle High German. It was obviously written by several hands, but none of the authors are known. The manuscript is called “Barenhaut” or “Bearskin” because its binding was made from the skin of a “sow bear”–that is, a male pig. The manuscript uses decorated initials, mostly in the same black as the text, to separate sections. The original plan was to illustrate it with paintings, but most of these are unfinished. The illustrations are configurations of miniatures, usually portraits of people or pictures of buildings. Only one page, the genealogy of the Kuenring family, is complete. The original is held by the Zwettl Monastery. This is a facsimile of the earliest surviving illustrated manuscript of the New Testament in the German language. The manuscript was commissioned by a German nobleman around 1430; the calligraphy and about a fifth of the illustrations were completed at that time, but for some reason the work was stopped. In the early 16th century the manuscript was purchased by the Elector Palatinate and famous bibliophile Ottheinrich, whose picture is on the cover. The Ottheinrich Bible was said to have the richest and most elaborate binding of any of Ottheinrich’s manuscripts. Ottheinrich hired the artist Matthis Gerung to complete the illustrations. The final version of the manuscript has 146 miniatures painted on gold leaf, and 294 ornamented initials. The manuscript was carried off as war booty at one point, and in the 19th century it was divided into eight parts. The facsimile actually recreates the first part, the Gospels of Matthew and Mark. For years the parts were scattered, but they have been brought together. The original is held by the Bayerische Staatsbibliothek in Munich, Germany. Diebold Schilling was the creator of three illuminated chronicles, of which this one, the Spiez Illustrated Chronicle, is considered the crowning achievement. It details the history of the city of Bern, from its founding to the year 1463. It was completed in 1486, shortly before the death of Schilling. The manuscript is written in Schilling’s own handwriting, and is illustrated with 344 pictures, many depicting scenes of war. Schilling is considered a great artist, particularly skilled at drawing the human body. The elaborate binding, with several metal clasps, is a copy of the original. The is held by the Burgerbibliothek in Bern, Switzerland.